The Texas coast is a favorite beach destination for Texans. It is relatively close and accessible, has affordable accommodations, and has a little sand in which to wiggle your toes. 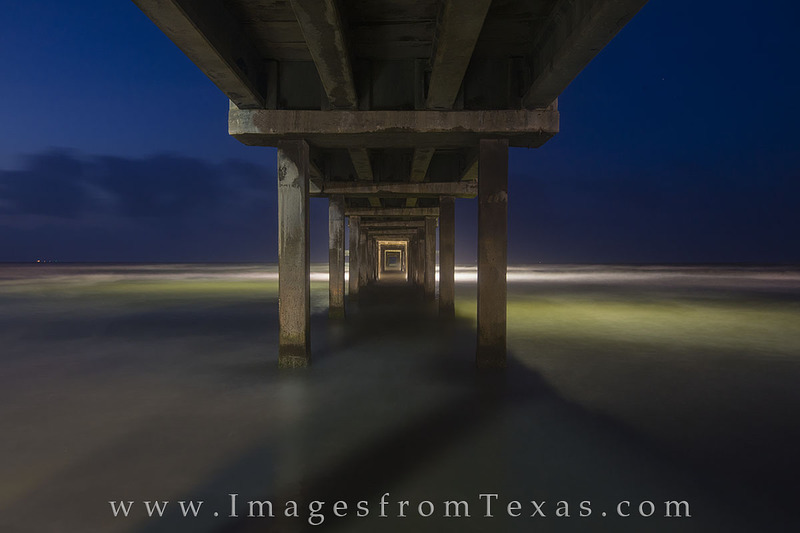 I recently had the opportunity to spend several days down there –primarily to photograph Port Aransas and the beach front in that area. I’ll be the first to admit I’m not a beach person. And I think I was spoiled in my youth – just out of college – as I backpacked Europe on the cheap, sleeping on warm sands in the Cinque Terre of the Italian Rivera and strolling on the shimmering sands of south France (all the while living out of a backpack and sleeping on trains – just so you know we were not traveling in style!) My wife and I even took several trips like this in our first years of marriage. Two kids later, and those days of carefree trekking are but a vague memory. But I wouldn’t have it any other way. So with the kids out of school, I was able to take my family with me on a little photography expedition along the Texas Riveria! I certainly don’t know the coastline like I know the Texas Hill Country, but I’ve been to Corpus Christi, Rockport, and Port A a few times. If I were a birder, this would be a paradise for photography. While I don’t have the patience to stalk our feathered friends, I was able to incorporate many of the seagulls and herons into the images. I also obsess over weather forecasts before trips, checking every outlet I can find in the days leading up to departure. For this trip I did not decide to drive to the coast until just a few hours before we left. The timing paid off, and several sunrises and sunsets were filled with oranges, blues, pinks, and other pastel shades. 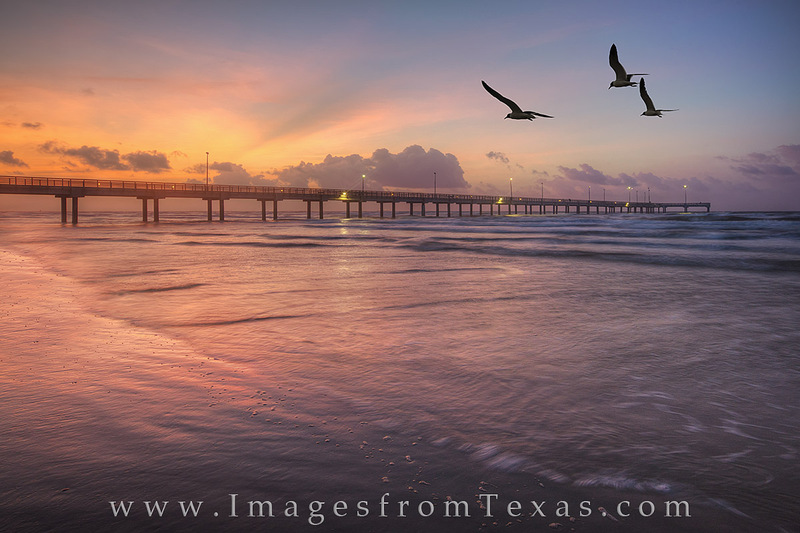 Seagulls soar overhead and follow the coastline near Port Aransas, Texas, on a colorful summer sunrise. This image of the gulf coast is several photographs stitched together. First, the coast, pier, and sunrise were captured. To capture the seagulls that were everywhere, I increased the shutter speed to freeze the birds in flight. The two were blended together to show the beautiful scene that played out along the beach that morning. For this trip, I mainly stayed along the beach near Horace Caldwell Pier (seen below). This structure is a fishing pier that juts out 1200 feet into the gulf, putting anglers in prime position to hook their next meal. For me, this pier served as a natural point of interest both from the side and from beneath. I always look for symmetry, whether in nature or in man made structures, and this pier offered exactly that. Horace Caldwell Pier appears here in the evening as lights from the fishing bridge light up sectoins of the walkway and the water. I loved the symmetry of this structure. The pier reaches 1200 feet out into the Gulf of Mexico from the Port Aransas beach and offers fishermen a place to (try to) catch dinner. Along the beach, my girls and I discovered that seagulls are not shy about begging for food, so when we smuggled some extra bread from of an overpriced pseudo-seafood restaurant, the gulls were quite pleased. They were skilled at catching morsels of bread in the air, and I used this trick later in the evening to capture these graceful creatures in flight during a beautiful sunset. 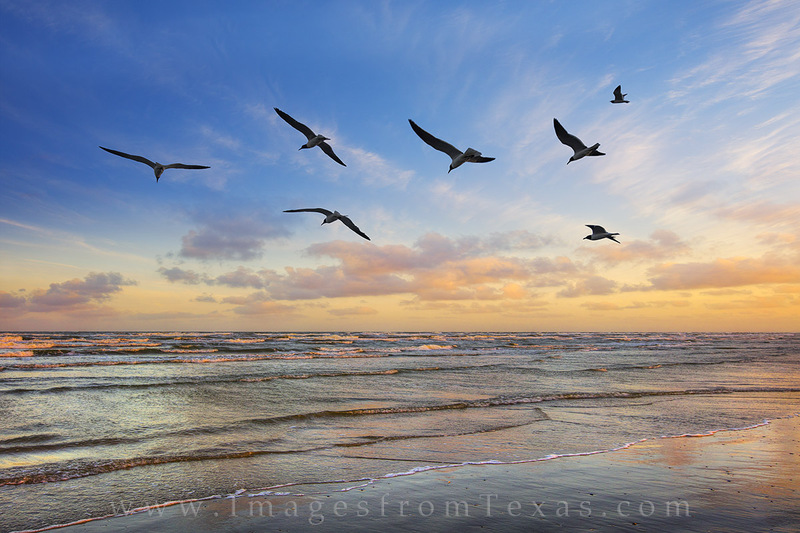 Along a quiet beach in Port Aransas, sea gulls glide in the breeze as the sun sets to the west. With the last light along the Texas coast, the low clouds turn orange and purple as the evening quickly comes to a close along this beautiful area of Texas. If you have question about the details of these images, please feel free to contact me. I suspect there is much more to Port Aransas than just the beach. And that just opens up the opportunity for another trip – perhaps in the fall when the temperatures are not so hot. In the meantime, safe and happy travels to everyone out there! Posted in and Gulf locations and tagged port a, port aransas, port aransas beach, port aransas images, texas beach prints, texas coast, texas coast images on June 16, 2016 by Rob Greebon.